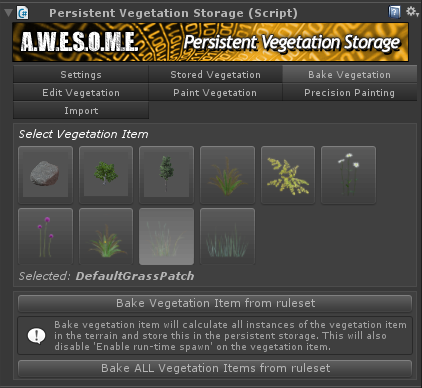 In order to bake the results of the run-time spawning rules to the storage package select the vegetation item you want to bake and press the “Bake vegetation from ruleset button”. This will create all instances for the terrain and store it in the package. Use the “Bake ALL” button to bake all vegetation items to the package. This will also disable the “run-time spawn” on each vegetation item. After bake it is loaded form the storage.